One of our favorite games is 10,000 dice game. It’s a fun and easy game that’s simple to play with a group of people but also makes a great 2 player date night game. Games like that tend to stick around. In the last few months, we’ve been playing games like crazy around here. The dice game 10,000 has made a strong come back. Big M even plays by himself (although his score is extremely high for those games… hmmm). Have you ever played 10,000? Some people call it Farkle. 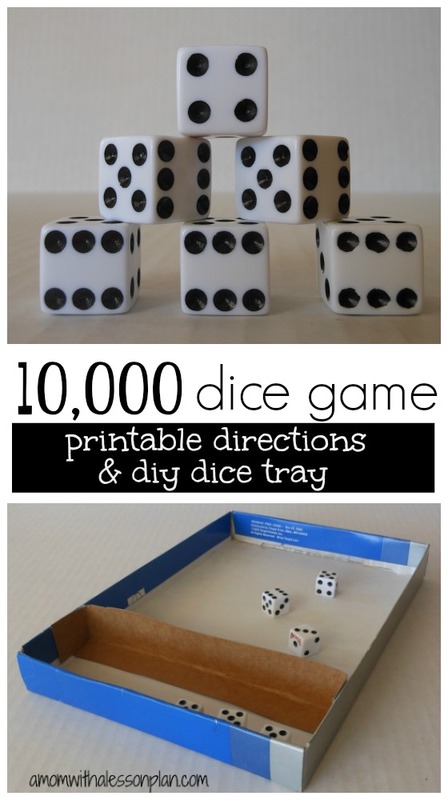 All you need are 6 dice and the directions. Click here to receive the printable directions..
Big M is 8 and Little M is 6. They both play without much help (we do give Little M a few strategy suggestions, but she makes her own decisions). I love how much math is involved, even for the players who are not writing out the score. The player with the highest score above 10,000 points on the final round wins. Decide who goes first by having everyone roll one die. Whoever has the highest number goes first. Play then continues to the left. The first player rolls all 6 dice. The player can decide to keep as many scoring dice as he/she chooses but must keep at least one. (See scoring section). Place the scoring dice off to the side and roll the remaining dice. Again the player may keep as many scoring dice as he/she chooses, but must keep at least one. Place scoring dice off the side and roll remaining dice. Player has kept all 6 dice. In this case, player MUST roll all 6 dice again adding to the previous score. Note: You must earn 1,000 to start scoring (meaning you can’t stop with 600). Once you reach a score of 1,000 or more you are “on the board”. Any turn after you are on the board you may keep any score you want (even if it is 100). When a player reaches 10,000 (or passes 10,000), every other player gets one more roll. Player with highest score wins. For each number over three of a kind you double the amount (example 3 2’s =200, 4 2’s =400, 5 2’s =800, 6 2’s=1,600). Pairs and Straights. When a player rolls 1,2,3,4,5,6 when rolling all 6 dice this is a Straight. When a player gets 3 sets of pairs when rolling 6 dice this is Pairs. Pairs and Straights are worth 5oo points. Note: Three of a kind must all be rolled together. Rolling a 1 and then rolling another 1 and another 1 is 300. Rolling 3 1’s at a time is 1000. One of the reasons we love 10,000 so much is that it’s portable. We have played on airplanes, while camping, at baseball games, while waiting at restaurants and in many delivery rooms. What makes it so easy to play anywhere is having a dice tray (we have one that was left over from a terrible game that ended up in the trash). There is something special about our dice tray because it has an area to put the dice that aren’t being rolled. Since I don’t recommend you buy that yucky game just to get a dice tray, I went in search of a different option for you. It was really easy (and free) to make this dice tray. I used an old shoe box lid and a piece of thin cardboard (a cereal box would be perfect for this). Cutting a strip long enough to stretch across the box and fold along the sides worked pretty well, but making sure I had another strip to glue to the bottom of the box made it really sturdy. I used a hot glue gun to glue the strip in place. EASY! If you like the dice game 10,000 you’ll love our favorite card game. Click the picture below to learn how to play Golf. Thank you so much for introducing us to this game. We played it today and had so much fun!!! This is a great game for getting children adding! Thanks again! YES! We got Farkle for Christmas last year, and everyone loves it! Who knew 6 dice could be so fun? Ok, and who knew 6 dice could photograph so beautifully? Gorgeous shot! I have never heard of this game! Thank you for the great tutorial – I think it will be a hit at my house! Yay! We love new games. Did your family like it? It is so funny. 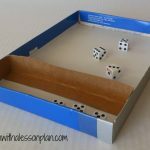 I just started playing Farkle for math with my boys (5 and 3) this past weekend, and then read your post this morning. The rules we use are the ones found on the box, but I may need to try your rules for the extra math they could learn. Thank you for the idea for the dice tray! 10,000 dice game — awesome game for the entire family! If I roll three 5’s, do I score them as both three of a kind (500 points) AND three fives (150)? Or just three of a kind? When u roll 3-1’s & it comes to 1000 & roll 2more which comes to a total of3000. What is the score if you roll the last die and its a1? Is it counted as 1000 or 100? 4 ones would be 2000, and a 5th one would double that to 4000….each extra duplicate doubles the score. One thing we do differently is we play with only 5 dice… One of which is always a different color and that one is the most important… “the double dice” so if the red (we always use 4 white and one red) is a one and one white die is a one it’s 1,000. It’s the way I was taught so I’ve never actually played with 6 dice or with straights. What a fun variation! We may have to give it a different name and try it out. Thanks for sharing! Been playing it for 25 years. We play with five dice but six would work too. Recently been teaching my hunting buddies the game and we came up with the rule that if your total you keep or automatically loose is less than the previous players you have to take a shot of fireball. Also a rule I heard was if the previous player stops to write total on board you can start off where they stopped and roll the remaining dice they have left. If the person picked up the remaining dice from the previous player and got a score, they get the score of the previous player plus what they rolled with those remaining dice right? Does the previous player lose the points for that round that they just scored? What would the score be for 3 4’s and 3 1’s in 1 roll? So, let’s say I roll 3 4’s on 1st roll. Does rolling another 4 on second roll result in any score? Or does it have to be strictly a 1 or a 5? Great question! Each roll is tracked on it’s own. So if on the first roll you get 3 4’s a 4 on your next roll would not count. 1 and 5’s are the only rolls that count as singles. Some older people might know 10,000 as “Oh Hell”. Ha ha… that’s funny! I could totally see that. I was taught to play this game differently.750 to get on board. As for the multiples of the same number the 3 of a kind is the same but nothing for the rest of that same number example 4 of a kind. You have to reach 10,000 exactly to win. if you dont score befor end of game does your bet double? This is for street 10 000. I used to play this game.This game is completely Whizzo! if you are surrounded by a monotonous environment then this game is highly recommended. when rolling a straight can you roll 12345 and work from that>? How would u score a 3/6’s and 3/1’s on the first roll? 3/1’s = 1000 when rolled together. 3/6’s = 600 when rolled together. I am looking for continuing a player’s roll with a non scoring pair. But did want to offer the way I learned to score. The real difference is with multiplying the dice for 4 of a kind, and 5 of a kind. Also some clarification MAY be useful. There is NO continuation; if you roll 3 6’s on your first roll. And roll a 6 on your 2nd roll, it should NOT be included as part of the first 3of a kind. In other words. It is worth nothing. 3 2s is 200, 4 2’s is 400, 5 2’s is 600, NOT 800. What happens if a die rolls off the board on your first roll? Can you re-roll that die and count it as a part of that first roll?? Me and my family got into a huge argument about this because I rolled two “1s”, three “5s”, and the sixth die fell off the board. I re-rolled the die that fell off the board and it was a “1”. They did not want it to count with the rest of the dice that I rolled, and thus they prevented me from getting three “1s”. I told them they were wrong, but they insisted that it shouldn’t count as part of my first roll since it fell off the board. This seems totally wrong to me. Ahhh man!!! That’s a tough one. When something like that happens we decide on a family rule to use from then on. When a player is trying to get “on the board” with 1,000 points does this have to done on one turn? We (my friends & I including my husband) played this game as adults in 1981 and it really kept our get togethers going for years. I recently found our dice and wanted to start again but couldn’t remember the rules. Thanks for the rules! Send the printable 10,000 rules sent straight to you.